Flowers-&-Vegetables Display ~ Carrots and lettuce leaves arranged around the inside of the wide vases create a unique look. 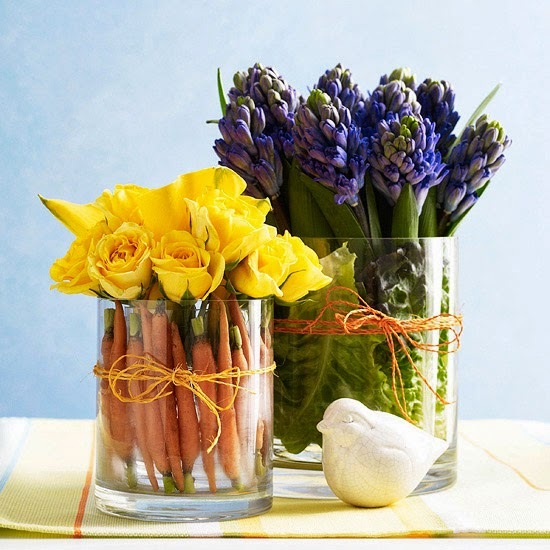 Keep the vegetables propped up by placing a smaller vase inside the larger one and laying the vegetables in between. Wrap string around the vases for a homespun accent. 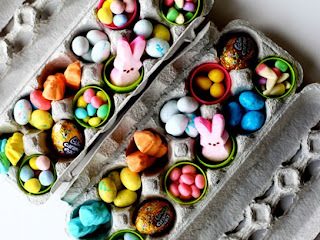 Place a decorative bird or bunny nearby to give the display an Easter touch. 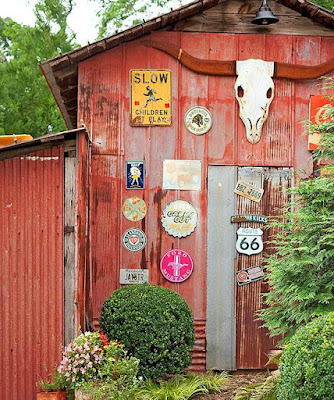 Springtime Door Decoration ~ Gather a bouquet of flowers, real or silk, into an umbrella for a door display full of country charm. 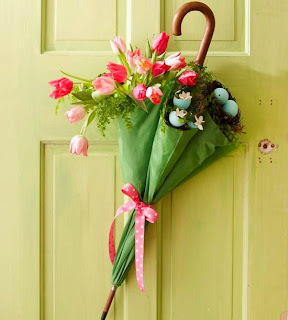 Tie a ribbon around the umbrella to hold the bouquet in place, and add a few dyed, blown-out eggshells for extra Easter fun. Twig Easter Nest Centerpiece ~ Celebrate Easter and spring simultaneously with this pretty table topper. 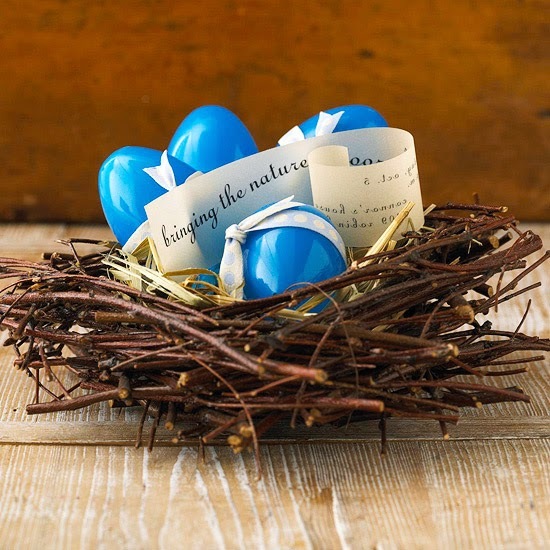 Simply purchase a faux bird's nest online or at a crafts store (or build your own), and fill it with plastic eggs for a quick centerpiece. 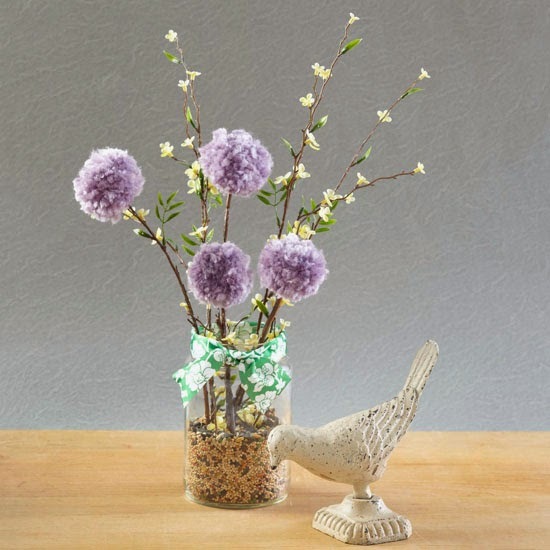 Spring Pom-Pom Flower Decoration ~ Faux spring branches and homemade pom-poms crafted from yarn are the perfect Easter accent for a side table or a mantel. 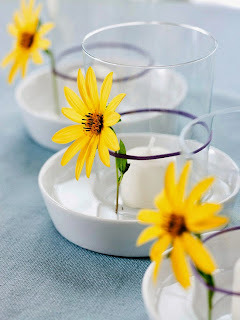 Dress up a mason jar with ribbon, fill with small pebbles or birdseed, and stick in branches. 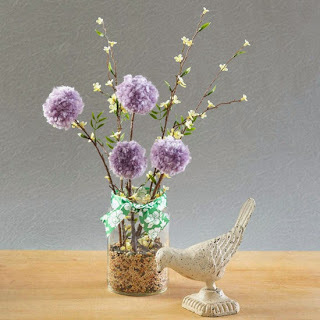 Learn how to make your own yarn pom-poms with our step-by-step tutorial, available here. 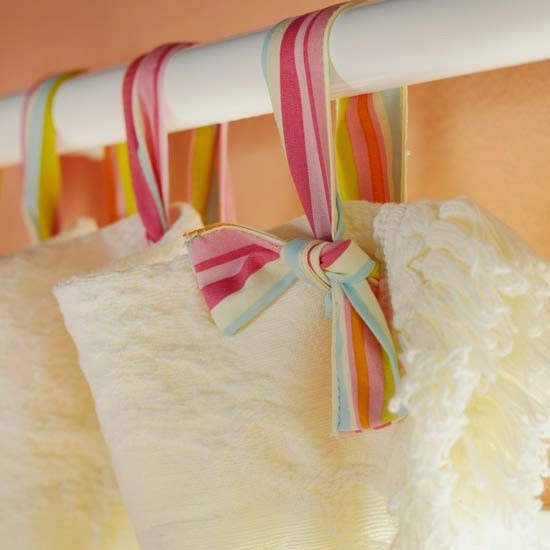 Spring Curtain Decor ~ Give the window curtains a little springtime sprucing by replacing curtain hooks with colorful ribbons. Be sure to tie the loops loosely enough to allow for easy sliding. Yellow Daisy Candleholders ~ Place a rubber band around a votive holder and tuck in a bright marguerite daisy, then place in a small dish with water. 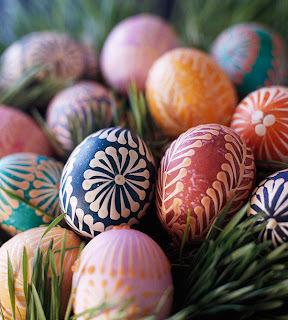 March a line of these down the center of a table or place one at each setting for a fresh Easter decoration. 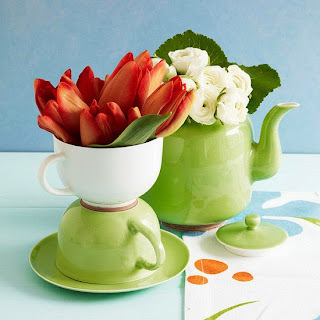 Tea Time Flower Display ~ Red tulips and white roses are awe-inspiring inside a stacked cup and kettle. Using two different colors adds interest, while the matching green dishes keep the display cohesive. 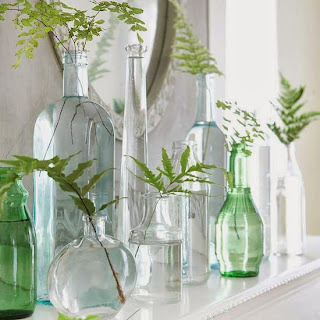 Simple Mantel Display ~ Cut plant sprigs and place them in vases and bottles for a simple mantel display that you can keep up throughout spring. Flower Easter Cups ~ Form a flowerlike favor by nesting a mini paper baking cup inside a standard-size one. 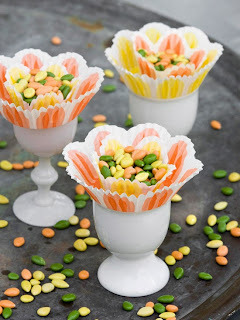 Perch both on an egg cup and fill with an Easter treat. 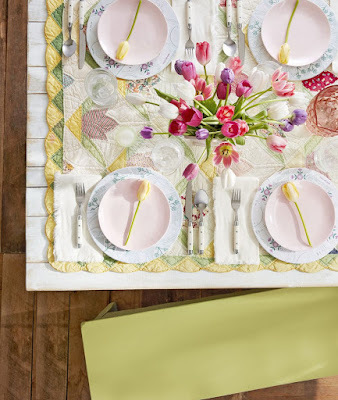 For a place card, prop a tag between the liners.